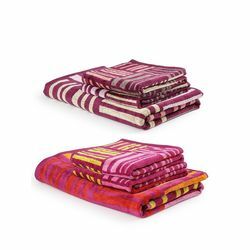 Turkish Bath Broken Check Hand and Bath Set is premium 100% Cotton Printed Towel. The bath Towel comes in a size of 70X145 Cm and the Hand Towel in a size of 38X58 Cm. The GSM of the set is 410. It very easy to maintain, Colour Fast and Machine Washable.